Whether you want to cruise along the coast, glide up an estuary, catch some waves or just have some family fun at the beach... you can do it all with a SUPrental paddleboard. Suitable for all ages and abilities. The perfect solo or group activity. And no better place to do it than on the beautiful Rame Peninsular in SE Cornwall. Learn the paddleboarding basics or perfect your cut backs on a wave... SUPrental can tailor your lesson to suit you. Just let us know what you want to learn! 1:1 and grp lessons available. Short and long term SUP rentals available. Delivered to a place and at a time that suits you... so you can paddle where you want, when you want. Whether you're staying at home, in a rental cottage/caravan, campervan or on a boat, you'll have no problem storing or transporting your Red Paddle Co paddleboard from SUPrental. FREE delivery within the Rame Peninsular, SE Cornwall. 10% discount when booking 2 + boards for 2 + days rental, or large group bookings. Also, keep an eye out for SUPrental at Cawsand beach in SE Cornwall where you may be able to hire a paddleboard at an hourly rate. The perfect activity for a birthday party, work team building day, hen/stag do or just a fun family day out. Session will be tailored to suit you. A relaxing exploratory paddle, or fun games and races... you choose! Prices pp vary depending on group size. Max group size 15. Come and join us for our weekly group evening paddle at various locations across the Rame Peninsular. An exciting, fun way to explore the area, get fit, meet other paddlers, and get some free paddle tips in a relaxed club atmosphere. Bring your own board and paddle with us for £2 or rent one from us at £12 per session. Suitable for adults only and those with some paddling experience. To find out where we'll be paddling each week, check on our website or facebook page a few days before (as weather dependent). To find out more and to book a place visit the 'paddleboard evenings' section on the website or give us a call. Booking essential. Check out our great deals on used and new Red Paddle Co paddleboarding equipment. We have some great deals on boards and paddles. Come and try before you buy! Or get in contact to find out more about the paddleboarding equipment we have available. 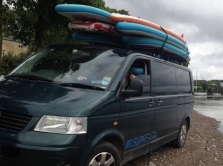 SUPrental are a mobile SUP school based in South East Cornwall on the Rame Peninsular. We paddle from a range of locations so we can make the most of the beautiful surroundings and pick the best paddling conditions. *FREE HOME DELIVERY to Whitsand Bay, Millbrook, Kingsand, Cawsand, Rame, Cremyll and St. John on the Rame Peninsular, south east Cornwall. We will happily deliver to other areas...please contact us for a delivery price.